When you have been blogging for a close to a decade, nothing surprises you any longer. Bloggers come and go, some reach new heights while other switch to new avenues. 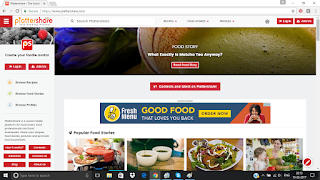 Somewhere in the last 2-3 years, I have been closely monitoring the emergence of many recipe sharing platforms or recipe aggregators as one calls them. And having been a part of quite a few of them, I know that they are doing really well and helping people pursue their passion for cooking/food. But working with Plattershare has proved to be something else ! Well I can say that because I have had the opportunity to interact with Kirti Yadav (one of the two founders) more than a few times. Take passion and cross it with vision. That's a deadly cocktail one would say. But I can safely say that it sounds more like her. From spotting food trends to cherry picking cooking talent for Plattershare, she does it all with a smile. God knows how she manages it with a kid ( I know that from my personal interactions with her which make really me feel like a team member ). She is a great inspiration and I loved the way she kept motivating and driving me as worked on a story for Black rice and it's recipes. The best thing that attracts me to Plattershare has got to be the 'Food stories' because at times just a picture of a recipe is just not enough ! One likes to read a bit of history or something more that stimulate the grey cells. The second thing is the neatly structured recipes that come with a rating. Like all good cookbooks, they mention the preparation/cooking time and servings. A definite boon when planning for a party or gathering. And finally, it has to be the overall structure of the website that reminds me of my favorite social media platform. One can just post a pic, add a recipe or when feeling more inspired, go for a full length story. And that kind of variety makes the browsing part rather interesting ! Does something so good needs to be bettered ? Well, when necessity fuels invention, one might build the refrigerator but when ambition fuels inventions one ends up with dreamy stuff like an ice-cream sundae !! So, why not ! The first thing that comes to my mind is related to regional cuisine. A basic search feature that allows one to search recipes by region/state/country may sound elementary but it is really useful for people who are new to cooking to want to explore recipes by region. The second useful feature that I can think of is to have a separate tag/section for 'signature recipes', recipes that are exclusively developed by a particular chef/blogger. The biggest irritant that I have faced during my blogging days is that of plagiarism. And I sincerely hope that Plattershare does something about it ! Being on Plattershare has been a wonderful experience in every way. Oh God...I am so humbly honored....love that feedback.